The city is the setting for much of the Studio Ghibli film, Grave of the Fireflies. There was heavy damage throughout the city from the Great Hanshin Earthquake on January 17, 1995. This city is also the setting for the anime The Melancholy of Haruhi Suzumiya. Remember that while taking pictures of Nishinomiya-Kita High School (where much of the anime is set) from the outside is perfectly legal, entering the gates to take pictures inside is NOT. Hankyu Imazu line is the setting for Hankyu Railway movie, where stations from Nishinomiya-Kitaguchi Station to Takarazuka Station appear in the movie. Nishinomiya has access to three airports: Kansai International Airport, Kobe Airport, and Osaka International Airport. Despite its name, Osaka International Airport is a domestic airport. There is bus service to and from the airport for ¥700 to Hanshin Koshien Station and Hankyu Nishinomiya-kitaguchi Station . Kansai International Airport also has bus service for ¥1700 (or ¥3000 round trip) to and from JR Nishinomiya, Hankyu Nishinomiya-kitaguchi, and Hanshin Nishinomiya stations. The Shinkansen(新幹線) is another option when traveling from other parts of Japan. Nishinomiya can be reached from either Shin-Kobe or Shin-Osaka stations. A one-way reserved ticket on the Nozomi from Tokyo to Osaka costs ¥14,050. A one-way reserved ticket on the Hikari Railstar from Hiroshima to Kobe costs ¥9740. Visitors can then take the subway or train to get to the city. To get from Shin-Kobe to Nishinomiya, take the ¥200 subway to Sannomiya and then either JR, Hanshin, or Hankyu train lines into Nishinomiya. Depending on the train stop, the ticket will only cost a couple hundred yen. There are three main train lines running through Nishinomiya: JR, Hanshin (阪神), and Hankyu (阪急). They run parallel to each other and go from east to west, with the Hanshin and Hankyu lines connected by the small Imazu line between Hanshin Imazu station and Nishinomiya-kitaguchi (西宮北口). Hanshin and Hankyu buses also run throughout the city, though it can be difficult to travel from north to south. 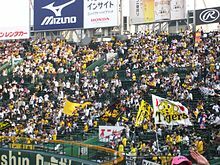 Fans at a Hanshin Tigers game. Along the Shukugawa River during hanami season. Hanami. Go to Shukugawa Park (夙川公園) end of March/early April for Nishinomiya's most popular hanami location. There are over 2300 cherry blossom trees along the Shukugawa River that stretches all the way from Hanshin Koroen Station to Hankyu Kurakuen-guchi station. Get off at either of these train stations or Hankyu Shukugawa Station to enjoy the festival. Mukogawa Cycling Road. This is a 7.1 kilometer long cycling road along the Mukogawa River from the JR line to Hanshin line. It's a nice place to enjoy cycling free of cars. Bikes can be rented for the day at hotels in the area. National High School Baseball Championship (全国高等学校野球選手権大会). Every summer in August, Japan's national high school baseball tournament is held at Koshien Stadium. Games are free so it's an excellent opportunity to participate in this popular national event! Eden (韓国料理エデン), ☎ +81 798-43-3876. 3-17 Ueda-Nishimachi (３－１７上田西町). Open 4pm-10:30. A local favorite! This is a small restaurant with a very friendly staff (speaks some English) and delicious, traditional Korean dishes. Vegetarian options available. Take Hanshin Bus from Hanshin Koshien Station bound for either Mukogawa-danchi (武庫川団地) or Naruohama (鳴尾浜) and get off at Ueda-Nishimachi (上田西町). Walk about one block north and the restaurant is on a corner on the left. Bus fare is ¥210. Cafe NADI, ☎ +81 798-52-7080. New Kobe Building 2F, 7-21 Shoraisho (松籟荘7-21 ニューコーベビル2F). Closed every Tuesday. Indonesian and Asian food restaurant owned by a Japanese wife and an Indonesian husband often dressed in Balinese attire. Small restaurant but has a nice and cozy atmosphere. Nasi Goreng and Mie Goreng are some of the favorites. Asian souvenirs available for sale. Take the train to Hankyu Kotoen Station and walk about 2 minutes south of the station. Gontaro Sushi (権太呂すし), Nishinomiya-shi Kofuen 1-7-9 (〒622-0832 西宮市甲風園1-7-9) (just north of Nishinomiya-Kitaguchi Station on the Hankyu line), ☎ +81 798-63-8333. 11AM to 11PM. A small sushi bar just north of Nishinomiya-Kitaguchi Station on the Hankyu line. An English menu is available and they are great for the price! 15 seats. This city travel guide to Nishinomiya is an outline and needs more content. It has a template, but there is not enough information present. Please plunge forward and help it grow! This travel guide page was last edited at 13:58, on 14 January 2019 by Wikivoyage user Traveler100bot. Based on work by Wikivoyage users Wrh2Bot, Mx. Granger, Ibaman, 隼鷹, Ikan Kekek, Halowand and Wrh2, Wikivoyage anonymous users 2003:7C:EF31:1E00:41BB:8782:C3BF:2E71 and 84.30.215.175 and others.